As a leading producer of material handling and safety equipment used in manufacturing, distribution and warehousing facilities throughout North America, Heartland Engineered Products focusses on increasing in-plant efficiency, space utilization and safety for their customers. Of course, they also strive to do the same for their own internal operations. One such example is the recent implementation of a new heavy-duty Combilift C10000, (10,000 Lbs. 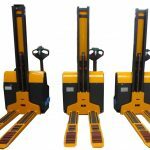 capacity), combination counterbalanced sideloader/narrow aisle forklift truck fitted with Manual KOOI-REACHFORKS®. Not only does the Combilift C10000 provide the lifting ability for their heaviest loads but, it also provides the maneuverability required for safely transporting long, awkward sized loads throughout their facility. Manual Extendable KOOI-REACHFORKS® complement this machine by providing variable fork lengths which are adaptable to the load depth at hand. This means the operator always has the correct fork length available. Gary Moore Shipping Manager at Heartland Engineered Products states, “ The Heavy Duty Manual Fork Extensions by MSE-FORKS are a user-friendly, time saving solution vs. the old fashion Removable Type Fork Extensions.” Thanks to the keen awareness of Product Manager, Bret Hebenstreit of ProLift Industrial Equipment, Heartlands new machine is equipped with easy to use adjustable forks which do not require any physical lifting. “The manual extendable forks reduce safety risks for their employees”, Bret says, “and they always have the right forks available for the job”.